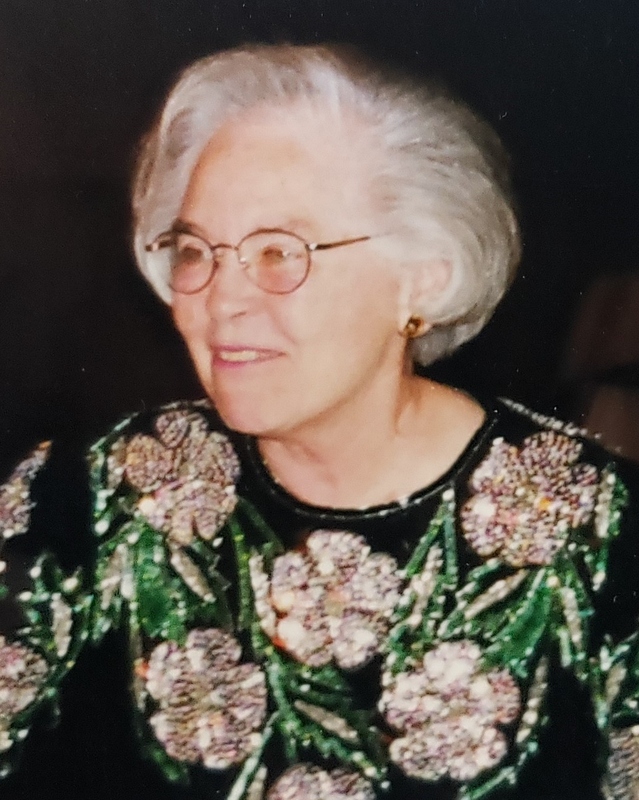 Jean Campau McGregor Greaves Ghio, 88, died peacefully on March 29, 2019, at Bishop Spencer Place. Jean was an entrepreneur and business pioneer, as well a literary savant and raconteur. She was born in Detroit, Michigan, the eldest child of Kenneth D. and Marian C. McGregor. She attended Wing Lake School, a one-room school house, for her elementary education. For two years during World War II, when her father worked at the War Review Board as a Dollar-A-Year man, she attended The National Cathedral School in Washington, D.C., which she adored. After the war the family returned to Birmingham, Michigan, where Jean attended Kingswood School, Cranbrook from which she graduated in 1947. She enrolled in Smith College in Northampton, MA, graduating in 1951. Immediately thereafter she moved to New York City where she entered B. Altman’s executive training program beginning a lifelong love of the retail industry. While there, she met and married her first husband, Donald C. Greaves, M.D. They moved to Oklahoma City for a few years before moving to Kansas City, which became her permanent home. She founded The Studio, a needlepoint store, with a few friends in 1967 in the Brookside neighborhood. She ran The Studio until 1977 when she became the first female vice-president of Jack Henry Clothing Company, in charge of visual merchandising, women’s clothing, and public relations. She held a similar position at Woolf Brothers Clothing, before she retired in the late 1980s. Above all else, Jean was a loyal, proud and frugal, McGregor, dearly devoted to her family and its Scottish heritage. As a youth, her happiest days were spent on the water, swimming, canoeing, and sailing competitively. Jean was active in the Kansas City community as a member of the Junior League, the Women’s Auxiliary of Kansas University Medical Center, a docent at the Nelson Atkins Museum, president of the Pembroke Country Day School’s Parents Association, and member of The 81 Club, among others. She was a life-long bridge player and musician, singing with The Smiffenpoofs, her college a capella group, and several Episcopal church choirs. Jean had a phenomenal memory, recalling verbatim verse after verse of hymns and songs, particularly those of Gilbert and Sullivan, as well as lyrics she wrote over the years to familiar tunes. She was given to bursting into song spontaneously, much to the chagrin of her children and grandchildren, all of whom have now proudly assumed that mantle. She was also a skilled calligrapher and crafter. She had a marvelous sense of humor and was known for her sharp wit and joke-telling abilities. Jean was a poet, editor, grammar consultant, and soundingboard to her children, many friends, and extended family. She met her second husband, James E. Ghio, shortly after she purchased a painting by Jim’s daughter. Following a whirlwind courtship they were married at her childhood home on Wing Lake in the summer of 1971. They were happily married for 38 years, and enjoyed attending the Lyric Opera, and Kansas City Symphony, as well as traveling, especially with their closeknit group of friends. Jean is preceded in death by her parents, Kenneth and Marian McGregor, and her husbands, Donald C. Greaves and James E. Ghio. She is survived by her daughter, Mary M. Hodge, and her husband, Charles; her son, Donald C. (Critch) Greaves, Jr., and his wife, Dawn; her stepson, James S. Ghio, her stepdaughter, Katherine A. Ghio; and seven grandchildren: Megan Geherin, and her husband, Patrick, Thomas Greaves, Caroline, Chase, and Lissy Hodge, and Adam and Ryan Widmer; her great grandchildren, Ella and Claire Geherin; her brother, Kenneth D. McGregor, Jr., and his wife, Janet; her nephew, Douglas McGregor, and his wife, Kitty, and their two children; her sister-in-law, Sr. Nancy M. Ghio, and her brother-in-law, John J. Ghio. Her entire family is most grateful for the loving care she received from the staff at Bishop Spencer Place, particularly Keyona, Robert, LaSonya and Cheryl, among others, who appreciated her vocabulary, humor, and feisty personality. In lieu of flowers, contributions may be made to the American Clan Gregor Society, Inc. 4189 Ashbourne Ct. NE, Roswell, GA 30075, www.acgsus.org, or the organization of your choice. A service will be held on Saturday, April 13, 2019 at 3:00 p.m. at St. Paul’s Episcopal Church, 11 E. 40th Main St., Kansas City, MO 64111. 11 E. 40th Main St.
A SCOTTISH BLESSING These Things I Warmly Wish for You: Someone to Love Some Work to Do A Bit o’ Sun A Bit o’ Cheer And a Guardian Angel Always Near. Rest In Peace, Jean Campeau McGregor Greaves Ghio. Such an incredibly fulfilling life. My husband Greg and I will always be appreciative of the kindness and acceptance offered to us by Miss Jean. Her candor, humor, intellect and sharp wit will always be remembered. We both cherish our memories of her. We are better people for having known her. Rest in peace, dear lady, and may peace and blessings be bestowed upon your family and loved ones. Manuel and Lillian extend their love and sympathy to the family of Jean, whose generosity and hospitality touched us deeply during our early years in Kansas City, and most especially to her daughter Mary who was the flower girl at our wedding. Prayers for the eternal repose of her soul. Jean Campau Mczgregor Greaves Ghio, my big sister, you sure had a profound, encellent influnce on me. Mentor, counselor, ever supportive, wise, and helpful in my life, i shall treasure our memories, and experiences forever.